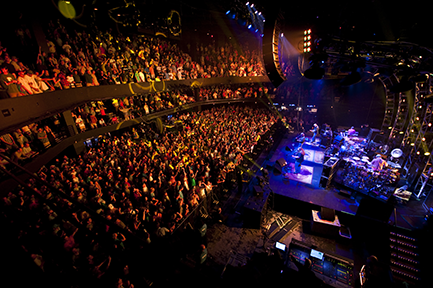 Austin nightlife thrives on the energy and diversity of its people. Whether you&apos;re looking for a dance party at a mainstream club, want to jam out to local bands, or just eat your way through food carts on every corner: Austin has it all. Check out this guide to Austin&apos;s entertainment districts and find your niche for a night on the town. Want to get down and dirty with the college crowd? Sixth Street is the place to be. Complete with cheap drinks, dancing, music and Greek life galore, this entertainment district is so wild it shuts down street traffic Thursday-Saturday nights. Top Pick: Blind Pig Pub - Dance on the rooftop and enjoy people-watching below as you listen to live bands. The East Austin Entertainment District truly embraces the meaning of "keep Austin weird." This young, hip crowd experiences the sounds, foods and drinks of many cultures in a single night as they strut the streets past graffiti-style murals from food cart to bar to coffee house. Top Pick: Ah Sing Den - Come for the music, stay for the cocktails; they&apos;ll take you back in time with their version of an Old Fashioned. This unique entertainment district is lined with historic houses converted into bars with as much personality as the city itself. You&apos;ll find local brews, great food trucks and rousing games of backyard corn hole. Rainey Street is perfect for a laid-back night of socializing with friends over live music. Top Pick: Banger&apos;s - Yes, there is a tattoo on their menu. And yes, it&apos;s free. As the name suggests, many of these bars and restaurants have been renovated from former warehouses. More mature crowds hang here and live entertainment and good food make for dynamic scenes. Top Pick: Cedar Street Courtyard - Live outdoor music seven nights per week. Enough said. Second Street boasts large selections of locally owned shops, restaurants and entertainment venues in the heart of downtown. The nightlife is trendy and chic, luxurious and sophisticated; perfect for the cocktail-sipping, up-scale crowd. Top Pick: ACL Live - The longest-running music television series in U.S. history is filmed at this 2,750-capacity concert hall (pictured above). Often referred to as "West Sixth," this district is Sixth Street fun without the college scene. A slightly older crowd sips pricier drinks at trendy bars complete with live music and stunning rooftop views. Top Pick: Brew Exchange - Buy low and take risks at this stock-market-style beer bar. Revered by locals as "So Co," this entertainment district gets its funky, hipster flair from its only-in-Austin shopping, live music and cuisine; not to mention some of the most photographed and famous street art in the city. Top Pick: Gϋero&apos;s Taco Bar - Hand-shaken margaritas, outdoor shows, Mexican beer and great tacos - viva South Congress! ATTENTION MUSIC FANATICS: This is your scene. From big-name acts to local newbies, these streets blare with the sounds of live bands. This is where the Live Music Capital of the World® successfully showcases its refreshing appreciation for diversity through sound. Top Pick: Stubb&apos;s BBQ - Local live music legacy dates back to Willie Nelson and Johnny Cash singing for their supper at the original Stubb&apos;s BBQ.